An attractive 925 silver Free-Flowing Badminton Curb Bracelet. 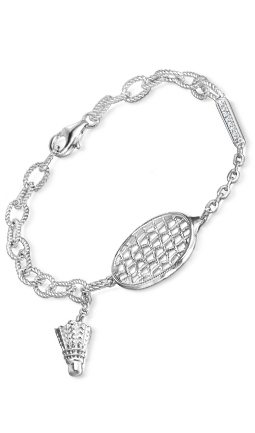 Cleverly incorporated into the silver links of the bracelet is a badminton racquet with 5 diamonds set in the handle and a small shuttlecock. 1 out of 1 reviewer recommended this product. birthday gift for GF! she never take it off after get it. So happy about it. thanks a lot for your help, Tristran. You really make something happen! all the best to you.